You are currently browsing the tag archive for the ‘decorations’ tag. is it ever too early for Christmas? We arrived home late because we both had so much to do at work. Now, it was after 7PM so we paused and heated up a simple supper and headed back out on a week night to get a few errands knocked off of our list. Running around town, we help each other check on projects to finish, lists of things to collect and eventual events to attend. Our last stop lay ahead. We paused and looked at each other. Weariness from a long day and busy night made us both wink at each other. “Last stop. Then we can go home and get some rest,” we cheered each other on. “OK, you get this half of the list and I will get the other half and rendezvous back up front,” my administrative hunter skills were kicking in. My beloved was efficient as she could be. Yup, distractions begged for her attention. Several extra stops were giving her the moment that shopping does to enliven her soul. For a few moments I was determined to finish my task and be the first one back to the meeting point. My every intention was mission-oriented. The task was at hand and I would accomplish it. Then, the unexpected happened. It had an immediate effect on my speed, focus and destination. With time passing by I stopped and slipped into another world. This is October and a fully decorated Christmas tree stopped me in my tracks. It was simple, yet grand. The use of ribbons and bows gave it an elegant look. 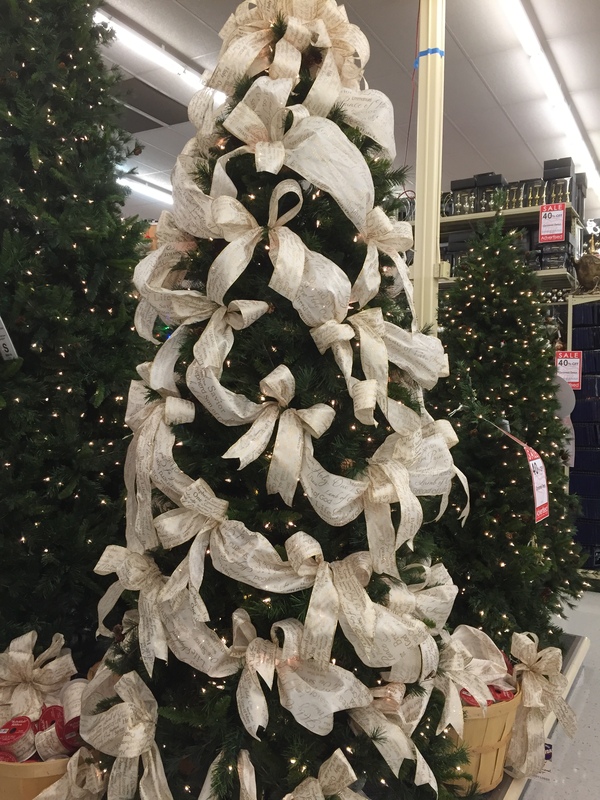 Some might say that there was more ribbon than tree. But, they would be wrong. The tree shape dominated the silk decor. Greenery contrasted with the white and gold fabric. Yet, the tree is not the meaning for me. This special symbol of the season gives me reason for great pause. In a couple of months, the birthday of the King will be upon us. Hope for a world in chaos, a joy that will silence the grit of war, peace that will sooth the hurting and hungry, faith will be anyone’s greatest strength when placed on the Baby and love will be shared with family, friends and fellow citizens of earth. This tree, this season changes everything in life. It does. Count on it. Believe it. It’s Halloween but Christmas is coming! Our errand day had us making at least a half of a dozen stops. I was getting worn out but chores need to get done. Making the best of a situation is all about being observant and creative in the fulfillment of the necessities of life. Have you ever been expectant when you strolled into a store but were totally shocked out of your confident disposition? I surely was. It is October, Halloween is not even here yet but the store what welcomed us into their showroom was already stocked to the gills with Christmas decorations. Similar to the pattern of grief, the initial shock was replaced by denial. “No, no, no, it’s too early for Christmas. We need to give the Harvest season and Thanksgiving their place in the calendar and in our family celebrations. Why rush a good thing. Then, there was a shift. Anger did not emerge. Instead, delight began to seep into my mind. A quick glance around the store and there was plenty of space given to the Harvest season and Thanksgiving. They had the rest of the year covered. Now, I lingered longer in the Christmas section. I was getting into the mood to anticipate this most special time of the year. My fingers traced the shapes of the musical instruments. Colorful cartoon characters dangled on strings ready to be hung on trees. Miniature reminders of the real Christmas story abounded on this wall of decorations. With a smile I took a moment to hum a favorite Christmas carol. No, it is not too early to look forward to Christmas. It is never too early to anticipate this time for family, food, fun and fellowship around what the birth of Jesus brings to all of us. No, I didn’t buy anything for Christmas. Not yet, any way. There is plenty of time to do that. For now, I left the Christmas aisles and chased down all that we needed for our errands for this Harvest Season. Looking forward to celebrating His birthday, though. When you love someone you look forward to their special day and the joy that comes with it. It’s not Christmas yet. Nor is it the season yet. But, it is coming and I know that I will be thrilled when it comes! My busy life at the office has very few gaps in a tightly wound calendar. It is a place where I engage people, planning, personnel issues and programming that challenges patience, problem-solving skills and perpetual glitches along the road of progress. However, I love doing what God has called me to do. There was a moment to breath. It is right after Thanksgiving and just before a busy Thanksgiving weekend of service. That is when I climbed the stairs of our home on a search for a special box. A few years ago I found that box in a store. It was on sale. For my purposes it was perfect and cheap too. I brought it home and unpacked its contents. This was a three foot tall Christmas tree. Not only was it tiny but it was also easy to assemble. I had it put together and standing on its own without even looking at the instructions. Now, this little tree has followed me around the country. I put lights on it, ornaments and even have a tree topper. Over the years it has brought cheer to me and my office staff. This year it has made its appearance again. When I found it in our storage closet, I picked it up with care. The years had worn out the box. If I picked it up without holding it together, the cardboard box would pop open and dump that contents on the floor. It is probably time to find a more permanent storage container for this little guy. The Saturday after Thanksgiving I brought it into my office. It only took moments to set it up. Since it is so small a single strand of lights is all it takes to trim this little pine tree. 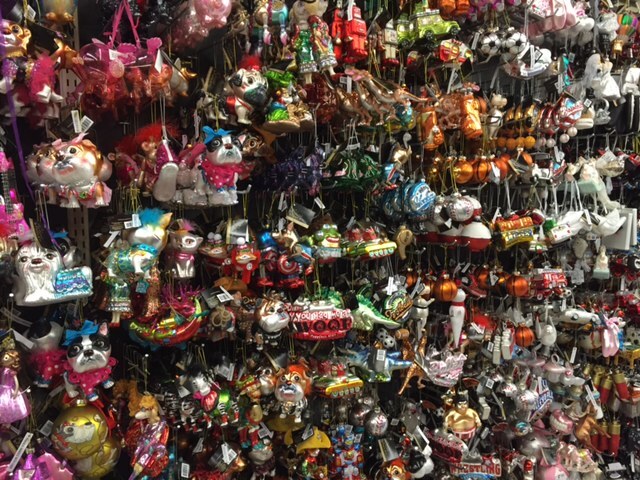 Then, I hand a bag full of ornaments. 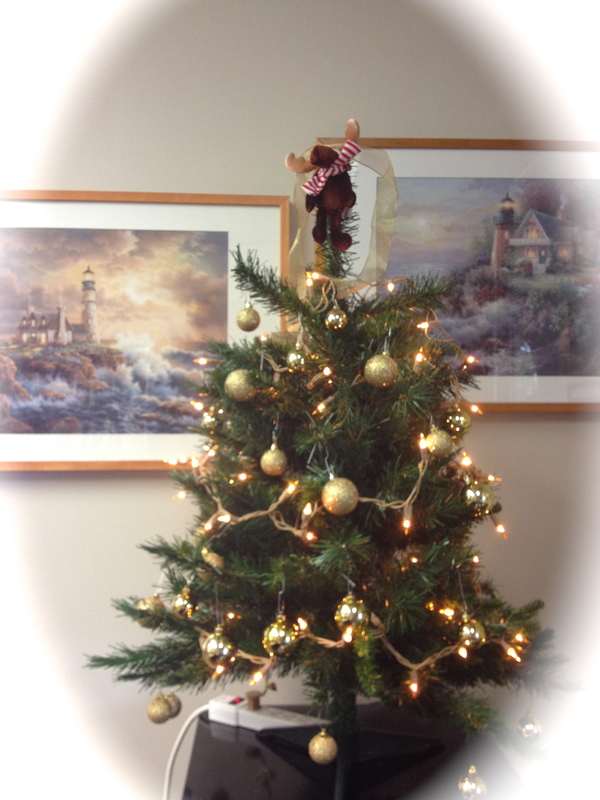 The tree topper is a moose, my favorite wild animal. There are special moments in life for everyone. Plugging in the lights and throwing the power switch is one of mine. I am no longer a kid but this special moment never ceases to make me smile. Standing back and gazing at my little tree captured my imagination and plunged it into my memories of Christmases long long ago. My office lights were off and the only source of light was from this single strand of Christmas lights. The ornaments were reflecting the lights and magnifying their effect. Such a little tree, making a big splash in my office and in the soul world of memories. Thanksgiving was really fun. We had laughter, great food, fun football, new friends, old friends and time to relax. But, it was also the best time to look forward to Christmas. We went shopping for some of basic life needs. Christmas decorations are basic life needs. Putting up just a few little features makes Christmas to be enhanced. We have two outside lights, one on either side of the garage. I replaced the bulbs with holiday red lights. They are low-wattage lights, a mere 25 watts each. However, when I turn them on at night they give off a celebratory glow. Just below each light I hung a plastic bow. It too, like the lights, are a bright red with glitter. At night the lights enhance the bows and the bows reflect the light and magnify the glow. On our front door we hung a beautiful wreath. It is a circle of greenery decorated with Christmas features. 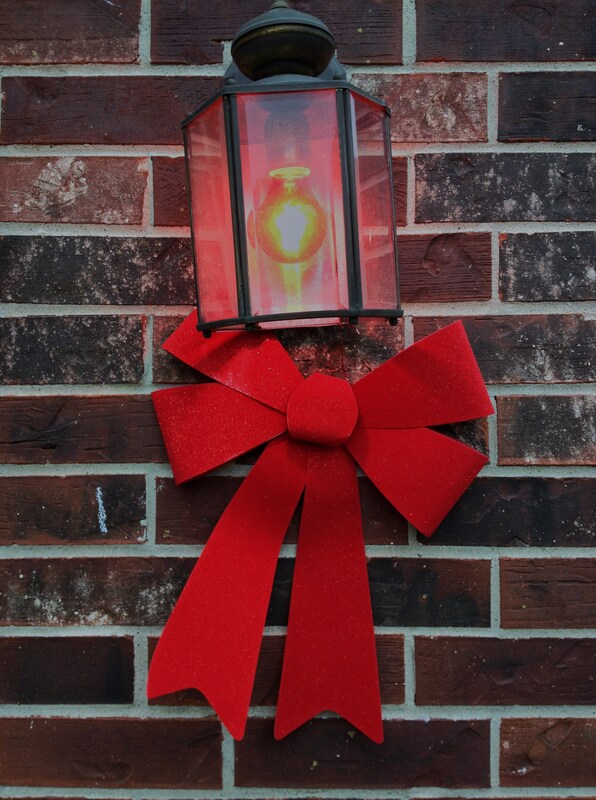 Anyone who comes to our home will sense the living spirit of Christmas is present in our home. Once the wreath was hung, I stood back and smiled. It is all part of the anticipation. Looking forward to the celebration to come is a symptom that the meaning of Christmas is a very real part of our lives. Next, I walked into my garage and flipped on the decorated outside lights. With a smile of anticipation I walked out to take a look at my handiwork. I was not disappointed. My grin broke into a wide smile. Christmas is coming. This special season of the year to count our blessings, celebrate Jesus’ birthday and consider the most amazing gift ever given. Our decorations are simple this year. One wreath here, a few lights there, a bow here and a small, a very small tree in my office is all we have put up so far. Every one of our family is else where in this vast country. Once we had a house full of children and we decorated together to make our home festive. Now, they each have their own homes and are off doing their own Christmas celebrations. Yet, it is not just about the children. When I turned on our modest Christmas lights, I smiled. After I stood back and gazed at our glistening bows, wreath and my humble little office tree, I loved that moment and the pleasure of anticipating the celebration of my Savior’s birthday.